An adorable double breasted little boy's bubble for Easter and any other special occasions. 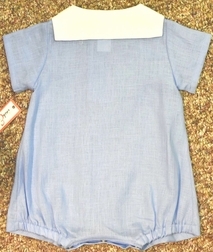 It is made in a robin's egg blue to match sister's dress and brother's double breasted blouse over shorts. 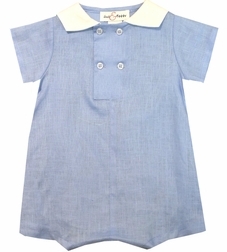 It has a white Peter Pan collar that becomes square in the back. White buttons embellish the front center. Looks lovely monogrammed on the left chest side (looking at the child) in white.